When the Rangers landed Jimmy Vesey as a free agent before the 2016-2017 season, it was overall viewed as a low risk, high reward move. After all, he only cost money, he had some good pedigree, and could slide into the bottom-six right away. At a quick glance, Vesey’s tenure with the Rangers has been relatively decent, with a line of 49-40-89 through 233 games. He’s rarely missed any games either, a usually under appreciated aspect of anyone’s game. The biggest fans of Vesey point to his blue-collar style of play, his nose for the net, and his consistent 15+ goal seasons. This year was his best yet on the score sheet, setting career high in assists (18) and points (34), while being one goal off his current high (17). If you’re into plus/minus, which I am not, then you’ll also note that Vesey was a -31 in his first two seasons and is just a -3 this season. The biggest detractors of Vesey will point to his possession and expected goal stats. Vesey has never been an advanced stats darling. His xGF% the past three seasons has been, in order, 44.06, 45.11, and 44.98. The issue isn’t with Vesey’s xGF either, it’s with his xGA, which has been a shade below a whopping 3.00 the past two seasons. That signals to us that Vesey has significant issues away from the puck. When you watch him coast around, the eye test matches the stats. 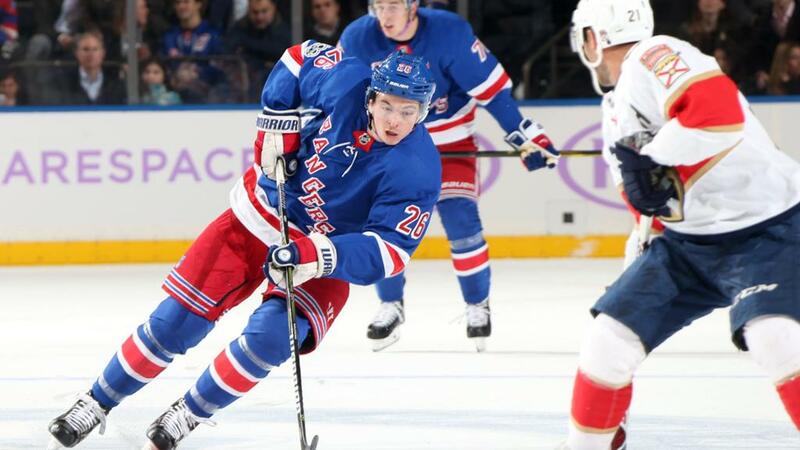 Compounding the concerns with Vesey are his age and current contract. Vesey is currently 25 years old –26 in May– and has another year left on his deal at $2.275 million, at which point he becomes an unrestricted free agent. It is not out of the realm of possibility that Vesey lands more than $3 million per year for his first major UFA deal. It’s tough to gauge where the Rangers will be after next season because there are a lot of unknowns. Vesey’s future may be tied directly to the futures of Vlad Namestnikov, Ryan Strome, and Jesper Fast. All three are bottom six forwards, and all three come with their fair share of pros and cons. All three will likely be on the team next year as well. Beyond next season, it’s really a crapshoot with those four. All four have some pretty rough numbers. When it comes to Evolving-Hockey’s Goals Above Replacement metric (GAR), the best player here is Fast at 0.8. Vesey sits at -3.0, better than only Strome at -3.8. However these are just single year samples on a really bad team, so this needs to be taken with a large grain of salt. In the end, Vesey’s future is more than likely going to depend on a combination of things, including next year’s performance, how the next wave of rookies performs, how the current crop of rookies progress, how the other three players in this quartet perform, and what everyone’s contract demands are. His future, like so many others whose contracts expire at the end of next season, is up in the air. "On Jimmy Vesey and his future with the Rangers", 5 out of 5 based on 10 ratings. He is a modern day Billy Fairburn (# 10). Not wholly objectionable, nothing particularly impressive, and no particular talent to contribute to win a Cup. Meh. Hey Rjcy, now their is a blast from the past. Billy Fairburn. A solid player, especially on the penalty kill with Walter Tkachuk. Good analogy in comparison to Vessey. There are a boat load of bottom six players that could fill Vesey’s role, at a reduced rate at that. Now having said that, I like this kid, big frame, and the only short coming is that he doesn’t crash the net enough for my taste, and needs to improve his defense as far as I’m concerned. If the organization is offered a better option, I would move on it, only because it’s a better position that we’ll be in. I’m not for pushing the kid out the door, he’s done what’s been asked of him, so there is no complaint. Here’s a name that could fill his role, and do a better job than Jimmy, but it may cost a bit more for him, Andre Burakovsky. He is a RFA, and the Washiungton Caps are in cap hell, and may have a difficult time resigning him. Andre is about the same age, has a more refined game, plays a solid two way game, but what would it take to get him over here at MSG? There could be movement at the draft, Jimmy may be one of the causality’s, but as stated above, I’m OK with any improvement even if we lose him for someone who fills our needs better!!!!!! I only laugh when a typo actually ends up being comical. I mean, seeing “gluten” posted instead of “glutton” in a comment about types of players was just too good to ignore. I didn’t take it personal, that’s why I said what I did, with the LOL after the remark. It’s all good man…. Read the good articles and leave, indeed, Joe Funny stuff! I think we know what Vesey brings. He won’t be a 30 goal scorer, but gets an A for effort. I would admit that he is a DQ type of player. He is one of about 10 middle 6 players on this roster. If another team loves him and the trade helps us, why not move him. Then again you can move him up and down the lineup without any issue. I feel indifferent on his play. This team is void of “special players”. Vesey, Names, Strome and others are all interchangeable parts in the middle of the lineup. If we can use any or even some of them to acquire a special player, one that has a higher potential ceiling or allows us to move up in the draft to acquire a better prospect, let’s do it. If any of the above names can help us get into the top 3 picks (along with something else of course), you have to move them. At 25, I think you know what you get with Jimmy – and it is pretty average. Unless they have to spend too much money to keep Vesey, or unless he is part of a trade that brings in a better player, there is not a huge reason to move Vesey. He is never going to be a great player but he is someone who is useful in his role. He has had occasions when he offensive skills seem better than others (I am thinking of the chemistry he had briefly with Rick Nash) so he will at times surprise you. I like the kid and just wish he was better away from the puck. Vesey is nothing special. Just another smart kid who took advantage of the system and signed the most lucrative deal available to him instead of the ELC Nashville and Buffalo were offering. He’s one of a massive handful of centers that have been moved to wing on this roster. He’s hasn’t put up 40 pts. Hasn’t scored 20 goals. He doesn’t specialize in anything. Not the best at anything. Not the worse either. Just average with no specialize skill set. So really, at the end of this 30 second conversation.. who really cares about Jimmy Vesey? He is a bottom 6 forward as of today and that’s playing one of the youngest squads iced in 30 years. Trade him? for what? Plenty of players as/with UFA and ELC’s that could fill his role and do it cheaper. Who’s trading away high level assets for some kind of draft pick(s) and a Vesey? The kid is a Harvard Grad. He comes from money. Daddy Vesey is in the NHL business too. He’ll be fine. He’s prob a very smart kid. He has all the connections to live a great life. But he’s an average none specialized hockey player that no one will care about an hour after he’s traded or walks to UF. Every team needs its cannon fodder, “pretty good” players who fill the gaps between the true talents on the team. In a salary cap world, no team can afford to have only elite, or even very good, players, except for the few times when they strike gold in the draft and pick up a player who’s a star from day one, and even that only lasts a few years, until free agency rears its head. Sadly for most GM’s, there doesn’t seem to be another Milbury or Chiarelli out there to take advantage of. Thus, we have the Vesey’s and Pionk’s, the Claessen’s and Nemestnikov’s, of the NHL, floating from team to team as circumstances dictate. Too inconsistent — and if we’re talking about more than $3m and the supposed “rebuilding” of this team then I’m thinking he (and Namestnikov — $4m) should be shopped (not given away). I really really like Vesey, when I notice him … I would consider extending Fast for a couple of years and Strome, unless both are looking for real raises (I think both play to about their salaries). Ooops, based on info that Adam Fox is returning to Harvard for his senior year I might have to adjust my thoughts on Vesey. If he’s in any way integral to landing Fox as a UFA then maybe we should extend him this summer at the best possible rate and for the shortest term. Fox (a righty) would be a GODSEND if we could sign him next summer. Great point Tanto…I think Fox is coming to is either way. I remember Brett Connolly getting kicked around…until he found the right roll…Vesey is a 17-20 goal scorer…you need guys like that to win. The trick is finding the 35-40 goal scorer that has eluded the Rangers almost as long as the cup has. Not true, remember, Marion Gaborik? I say this year’s coaching is making all the difference.